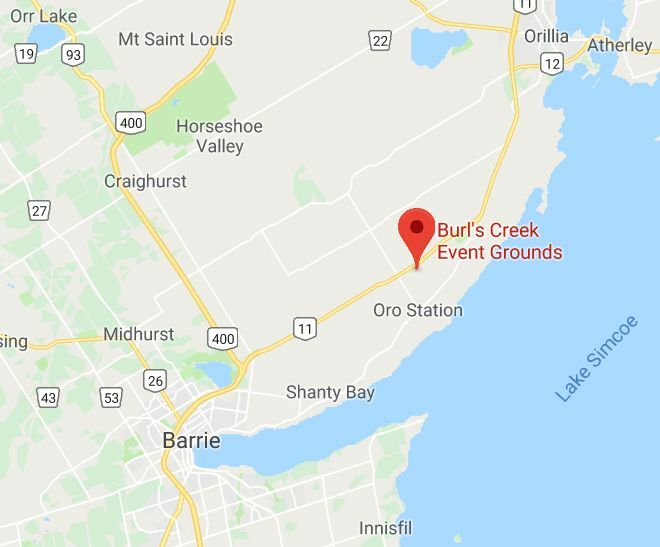 The Rolling Stones are expected to be performing a show on Saturday June 29 at the Burl's Creek Event Grounds, 78 miles i.e. 124 km - 1.5 hours driving by car - from Toronto City Center Union station. The announcement is expected for 8am Monday Morning EST i.e. local time in Toronto Canada, which is same time in NYC and US East Coast, 2pm Europe Monday, 1pm UK etc. Nearby locations for accomodation would be Barrie and Orillia. 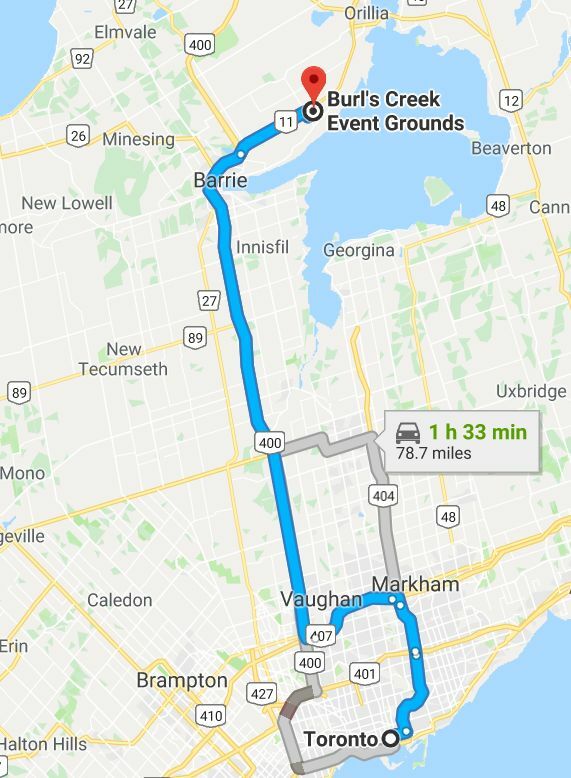 While Barrie is in the direction of Toronto City, Orillia is further north east, and might be easier for traffic, as the event grounds do have a capacity of 100,000 fans. Edited 4 time(s). Last edit at 2019-02-11 13:50 by bv. I guess they are going to have make Canada flag pins after all! There is always room for Canada on Stones tours. In the middle of the European Tour 2003 they flew out of Prague to perform in front of a record crowd of 450,000 fans at SarsStock, then back for the rest of the European tour. Now 16 years later the ditance is shorter from Chicago to Burl's Creek Ontario. I am so happy for all the great fans in Canada. This show will be just eight days after the midsummer night, a real summer show for sure. Edited 1 time(s). Last edit at 2019-02-11 11:36 by bv. Any layouts of big events at Burl's Creek known? The official Burl's Creek site was up and running last week, but now it is "closed for maintenance" i.e. updates. Normally they have 40,000 or so country misic fans there, but the capacity should be 100,000. I bet there will be a lot of hot dogs, beer and water on sale. The biggest income from SarsStock was beer sales I think. If they do it with a couple of warm up acts they can sell beer all day. Edited 1 time(s). Last edit at 2019-02-11 13:44 by bv. Congrats to my Canadian friends and others heading to this!! (although seriously considering it ) type event. Looking forward to the reports!! Just booked a hotel room in Barrie. Girl was already wondering what was going on. They don't know yet, so hurry...I actually live in Toronto but I know that trying to get to the site the day of show from Toronto is going to take hours...no exaggeration., so I booked the might before. It;s going to be a mess. It's Canada Day Weekend and Barrie has it's own in town festival going on. Edited 2 time(s). Last edit at 2019-02-11 13:52 by ThePaleRider. I have seen prices on hotel rooms increasing quite a lot in both Barrie and Orillia over the past few days. Later today they might be all gone. Edited 2 time(s). Last edit at 2019-02-11 14:42 by ThePaleRider. Room booked for 28th & 29th! Easy pass here. I would be able to rebook my return flight from Chicago to Helsinki, but that alone would run me 200€ and I'd still need to get back to Chicago from Toronto as SAS doesn't fly out of Toronto. That's another 200€ - before the ticket. Accommodation wouldn't have been too much a problem because my uncle lives just outside Barrie. Anyhow, after Prague I told myself "no more open air shows". Happy for Canadian fans though! My favorite country, they totally deserved a show. Edited 2 time(s). Last edit at 2019-02-11 14:34 by Topi. I'm so thrilled that the Stones are playing in Canada at this site! It's Canada Day Weekend and it's our biggest national party! Try to get a room as close as possible to the site to avoid the traffic. Even with the traffic congestion it will be absolutely memorable! They can sell pot and beer all day! Tune into [rock95.com] for the announcement soon. Anything about the ticket prices, golden circle, pit etc.? Presale Wednesday, general sale Friday. Just from a crowd control standpoint I'd bet they will have different tiers of tickets. One big GA without fences is too dangerous. Edited 1 time(s). Last edit at 2019-02-11 15:10 by Topi. Another big adventure shaping up with show start at 2pm... should be a 3 or 4 band lineup! Shades of Molson Canadian Rocks Toronto in 2003! Epic! my curiosity now, is who else is preforming,,?? Yes, but this is 2019. You're required to wear a helmet if you attend a concert! If ticket sales are fast, they might add any warmup they like. If tickets go slow (theoretically, very much so), then they might add bigger acts.